January 23, 2011 - Joseph Aquino, 31, Warwick, Rhode Island, pleaded guilty in U.S. District Court in Providence on Friday to a federal charge of willfully interfering with the safe operation of an airborne commercial aircraft and endangering the safety of the 23 passengers and three crew members onboard. Aquino illuminated the cockpit of an incoming flight on final approach to T.F. Green Airport in Warwick with a laser light, momentarily blinding the pilot. Aquino entered his guilty plea before U.S. District Court Chief Judge Mary M. Lisi. Aquino's guilty plea was announced by U.S. Attorney Peter F. Neronha; Richard DesLauriers, Special Agent in Charge of the FBI's Boston Field Office; Colonel Brendan P. Doherty, Superintendent of the Rhode Island State Police; and Warwick Police Chief Colonel Stephen M. McCartney. At Friday's change of plea hearing, Assistant U.S. Attorney Luis M. Matos told the court that on September 15, 2010, at approximately 10:00 p.m., the control tower at T.F. Green Airport received a report of a laser strike from the pilot of an inbound Continental Airlines flight from Newark, New Jersey. 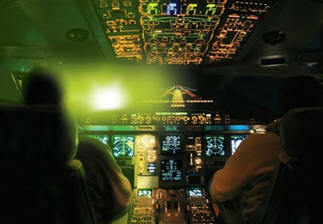 Upon landing, the captain and co-pilot of the aircraft reported that about three miles out, while on final approach to the airport, the left side of the flight deck was illuminated by a very bright green laser and that the captain was struck in the face. The laser was then fired a second time into the cockpit of the aircraft which at the time was below one thousand feet during a critical time in the sequence of landing the aircraft. The laser strike caused the captain temporary blindness. At about the same time, a person pulling a boat into a marina in the Oakland Beach area reported to police that he and his crew were struck by a green laser. The crew reported being struck in the face several times. The person reporting the incident identified individuals who were standing on the beach that may have caused the laser strike. Warwick Police responded and discovered Aquino and located the laser. At first, Aquino admitted to Warwick Police officers that he had shined the laser on a boat and vehicle, but denied shining it into the cockpit of an aircraft. Later, during further questioning, he admitted to investigators from the FBI and Rhode Island State Police that he did shine the laser at an approaching aircraft on two occasions. Aquino is scheduled to be sentenced on April 21, 2011. He faces a maximum sentence of 20 years' imprisonment; three years' supervised release; and $250,000 fine. The matter was investigated by the Federal Bureau of Investigation; Department of Homeland Security - TSA, Rhode Island; Federal Aviation Administration; Rhode Island Airport Police; Rhode Island State Police; and Warwick Police. Was Comcast Bind Keith Olbermann Departure?